What a way to open the year! While we have been figuring out who the real winners are from the Tax Reform Act...(and taking a little R&R) the Tax Return Beneficiary Trade (TRB Trade) came to a halt in the first hour of trading in 2018. It looks like all the panic sellers of transformational tech to raise cash for the TRB Trade in 2018 had seller's remorse and figured out what we have been saying all along. Think for a second; beyond just the next few months. Our secular high growth and high margin/profit 2018 tech leaders are ALSO the biggest beneficiaries of corporate CAPEX spending. Why? 1) With immediate 100% expensing of ANY equipment purchased ...a plane, robots, advanced surgery robotics, data center, trucks, R&D, software ... we just witnessed a Transformity event: the shift of new aggregate demand (at the margins) TO the B2B (business-to-business) economy FROM the consumer economy. ALL US companies (and foreign companies with a US subsidiary that pays US taxes) NOW have a $trillion Keynesian cyclical fiscal boost. They will look to spend some of the 10-100% bump in after tax EPS to increase automation and productivity...which is software AND robots and it will all sit in the cloud. 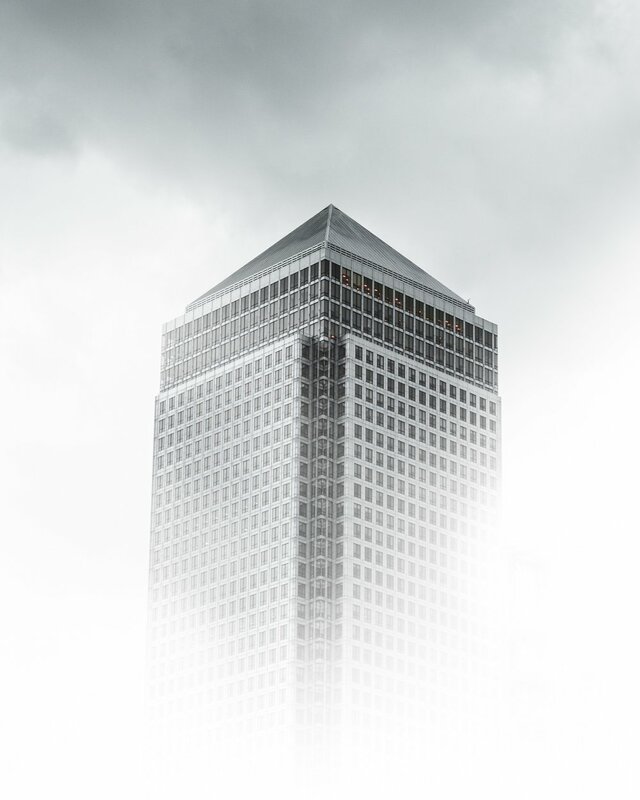 They will add Artificial Intelligence/Machine Learning technology into as much of their Business Process Operating and customer facing systems as they can. 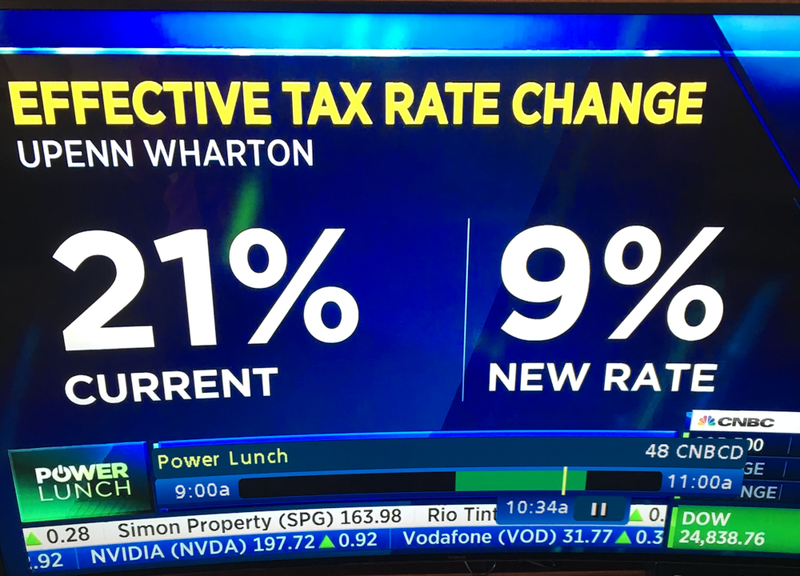 More important--with the corporate effective tax rate on average down to 9% from 18-21% depending on industry...the ROI "hurdle rate" or the after tax investment return on capital invested is now 50% LOWER! Projects that did not pencil at 21% or higher effective tax rates now DO! This brings a massive incremental boost to B2B capex. But wait there is more! Next US based global companies will repatriate $trillion+ of offshore cash some of which goes to R&D and key talent salaries ...but most of that corporate cash (based on the Bush 2004 repatriation act) will go to buying back stock, paying off debt and paying dividends. Puls...what the new US Tax Act does is establish a new target for OTHER countries to get THEIR corporate tax rates LOWER than the US...like Canada and UK already have. Christ even FRANCE is significantly lowering corporate taxes!!!. Key Point: ALL these factors are transformative events for all US based global companies...and for mega cap foreign companies sitting on $hundreds of billions of new profits they now have in US based subsidiaries. Daimler Benz reports $3.5 billion in higher profit from US based subsidiaries based on lower marginal tax rates. Toyota and other vehicle manufacturers too. REALLY KEY POINT: The domino effect of this race to be the lowest corporate tax sovereign has created a self-reinforcing corporate EPS growth feedback loop. More after tax free cash flow increases corporate value on a DCF basis. 100% expensing of equipment vs. 5 year amortization creates up to 50% LOWER capex ROI hurdle rates. More after tax cash flow that can be invested to increase productivity/output per hour of labor increases pre-tax profit margins. Repatriation of offshored cash goes 90%+ to REPURCHASING SHARES or making earnings accretive acquisitions of smaller competitors which AFTER consolidation (and the firing of high paid redundant professional staff) increases MARGIN thus after tax EPS by 10-20-30% --which drives share value! So think: Who benefits most from a self-reinforcing accretive EPS growth feedback loop? It's the company that can put the HUGE bump in operating cash flow to work buying accretive competitors, adding infotech automation AND buying back 20-30% of their outstanding shares and paying higher dividends. Which companies are they buying all that infotech automation from? 20%+ 3-5 year SECULAR growth infotech and healthcare technology companies for the most part. I think institutional investors are seeing what we see: That when you cut effective corporate tax rates down to 9% from 21% and allow 100% expensing of equipment for 5 years what has REALLY been done for B2B technology companies is the ADD a Keynesian CYCLICAL economic stimulus boost (i.e., government based fiscal economic stimulation) to the Fed's already existing MONETARY stimulation which supercharges their already existing SECULAR 20%+ 3-5 year growth rates which already exceed the nominal GDP growth rate of 3% by 7-8 times of more! The US Tax Act has created a set of US based global technology companies that are B2B Super Cyclicals...20%+ annual growth rate companies now juiced by a massive $trillion Keynesian fiscal stimulus aka B2B aggregate demand juiced by 50% LOWER after tax capital investment ROI hurdle rates plus historically low monetary interest rates that all ADD to their already existing high secular (3-5 year) 20%+ growth rates that virtually guarantees 10-20-30%+% HIGHER EARNINGS PER SHARE on just the SAME top line revenues and secular growth rate. This is what the dumbass politicians could not express because they mostly are clueless to how capital allocation and CAPEX decisions are make in the corporate world. 100% expensing of equipment vs. 5 year amortization creates up to 50% LOWER capex ROI hurdle rates. The Macro B2B Economic Transformity : Hundreds of thousands of equipment or tech or automated manufacturing or even energy drilling ROI decisions just got 50% easier to get approved! My Money Magnet BEAT BEAT RAISE Investment Thesis: Let's call our true 3-5 year secular transformational growth sectors and their leading IP owners "Money Magnets" in the sense that their secular cycle of "Beat Top Line Forecasts/Beat Bottom Line EPS/RAISE Forward Guidance" performance is like crack cocaine for growth investment money and leveraged hedge fund money (and longer term option speculators too!). And what will kick off this BEAT BEAT RAISE equities appreciation cycle are the sell-side equity ANALYSTS who are WAY behind the curve on building in the BEAT BEAT RAISE numbers into their top line/bottom line and equity valuations. Example: Just today 29 pubco companies (out of 2000+ with analyst coverage) RAISED all their numbers and bumped target prices. Just 1970 covered companies to go! Then as earnings season starts in 10 days CEOs start with the BEAT BEAT RAISE story...but especially our Super Cyclicals companies. Then the "Merger Monday" deals start loading up...and then Storify goes public without an underwriter which opens the floodgates for other $billion+ valued Unicorn" tech companies to do similar LOW FLOAT non-underwritten underwritings which MY guess is will SOAR after listing. OK...you get it. ALL of this stock buyback and M&A activity REDUCES available shares to buy (we have 3500 pubcos not counting microcrap stocks) vs. 8500 ish in 2000. We had 1500 IPOs in 98-99 Internet bubble...now we have 35 in 2017. The increase in dividend payments will go to less shares which increases % paid per share. Accretive M&A after consolidation increase EPS and pre-tax operating margins (back office staff reductions spread over larger base of top line revenues). Action Plan: The Global Super Cyclical Technology IP leaders + some big US based Tax Act beneficiaries (35%+ marginal tax payers with heavy capex spending like Delta Airlines or Fed-X for instance) are off to the races in 2018. Idon't think the average investor has this reality dialed into their investing plans...but institutional investors who did not wait for the Sell Side analyst upgrades DO GET IT. First: Buy the leveraged TQQQ ETF at market tomorrow and on any pullback under $150. Target $220. TQQQ is the Nasdaq 100 at 2X upside. The QQQ is DOMINATED by our Transformity Super Cyclical Tech IP leaders (what we used to call "Game Over Dominators" for my old ChangeWave subscribers). Let's go back to our November 11, 18 and 21 Alerts and Updates and see where we are! "Lam Research (LRCX) "NOW look at what happens to LRCX (a 12-forward P/E stock growing its earnings at 30-40% next year) when it marginally drops below its 50-day moving average; it gathers itself for a few days and THEN traders and investors who have missed out on our almost 300% gains in Lam Research go “bargain hunting” or repurchase the same amount of shares they “rang the bell” aka took profits on today. "Key Point: This means there are REAL FUNDAMENTAL BUYERS for Lam Research that are bargain hunting on this two-day correction under/around its 50-day. It’s relative strength is almost completely oversold (30-32 RSI is it’s low range) so I’d expect a bounce tomorrow and another retest perhaps on Thursday/Friday if the Senate passes it’s Tax Reform bill and goes to committee with the House to reconcile the big differences in their bills for a final vote." Action Taken: We added another $10,000 into LRCX at $192.33 (closing price) and hope you take advantage of any "screaming buys" under $190. Shopify: NOW you Understand Why We Took Our $30k profits on the melt-up! "So Shopify’s chart tells us we have risk back to $97-$95 lowest..but the SHOP sell-off was is LIGHT VOLUME. IN this case with a $4.30 bid on our remaining 560 options (with .75 cents cost and ZERO cost basis) here is how I recommend to play this (and will in our portfolio). 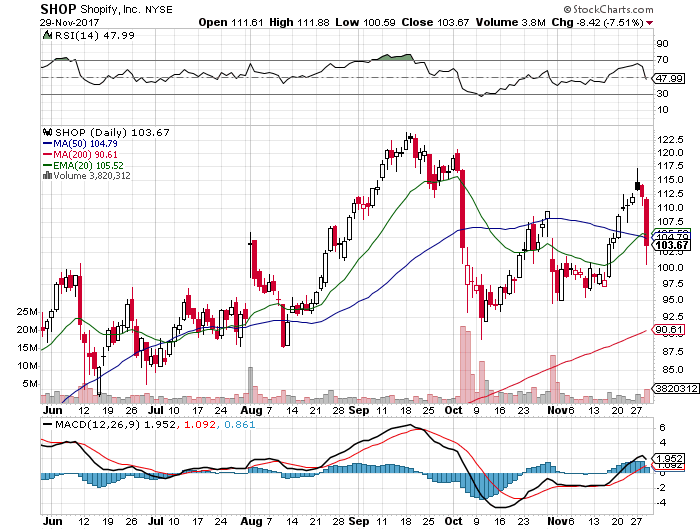 SHOP is trading UP at $104 in the post-market--I will check again at the open". IF IT reclaims its 50-day low around $104.50 we will hold onto the remaining options IF buying volume is at least near the 3.8 million shares it traded today. Remember this whole sell-off came from Citron report that Shopify was a “get rich quick” scam RIGHT at the peak of the melt-up and 20 days BEFORE their earnings when they could not defend themselves (earnings quiet period). Action Taken: Well SHOP did close at $103.827 on November 30 and did not reclaim it's 50-day average and it traded 2 million LESS shares traded so we closed remaining options at 3.95 for a whopping $69,500 profit and our $10,000 original investment back or $79,500 total. We are about half way to break even on this 10% move in AMD on news that Intel CPUs have serious problems. Here is the best rendition of the story from Engaget. AMD has released a statement that it accesses it's kernel memory in a different way so it has ZERO risk unlike Intel. "Intel is grappling with another major security flaw in its processors... and this time, the cost of fixing it may be very steep. Researchers have discovered a design vulnerability in Intel CPUs over the past decade that covers the ability of ordinary programs to determine the content or layout of protected kernel memory (i.e. areas reserved just for the operating system). While the details appear to be under embargo for now, the fix is to completely separate the kernel memory from those ordinary processes. That could carry a significant speed hit, since it requires switching between two memory address spaces every time there's a system call or a hardware interrupt request. How much of a slowdown you see depends on the processor and the task in question. The biggest blows are expected to come to virtualization systems like Amazon's EC2 or Google Compute Engine. The Register claims the performance hits could range from 5 percent to 30 percent, but there's evidence to suggest steeper hits might be possible. Whether or not this affects everyday tasks like gaming or web browsing is another matter, though -- there has yet to be comprehensive testing. As it's a chip-level flaw, the bug affects virtually every operating system, including Linux, macOS and Windows. Software fixes are known to be in the works for at least Linux and Windows, but a true solution that maintains performance will require changes at the CPU level. Notably, though, AMD reports that its processors aren't affected due to key differences in memory handling. To call this ill-timed would be an understatement. After years of maintaining a fairly secure performance lead, it's facing stiff competition from AMD's Ryzen and Epyc processors. The last thing it needs is a security hole that not only requires design tweaks, but could slow down virtually all the chips it sells once patches are in place." A new innovation in computer chip architecture is taking hold, Benchmark Researc notes, and it could be "disruptive" for traditional processors (and a possible boon to companies getting on board). RISC-V is the latest version of the "reduced instruction set" architecture, a more modifiable system allowing for more customer tailoring of silicon, and a note from Benchmark's Gary Mobley highlights what's going on in the area. Western Digital (WDC +1%) has "pledged to transition its own consumption of processors to RISC-V," Mobley notes, and Nvidia (NVDA +5.7%) quietly noted it will build its next-gen GPU microcontroller on the new instruction set. From Barrons's this afternoon. "If you like semiconductors, you should really check out this “RISC-V” thing, according to a missive today from Gary Mobley of The Benchmark Company. RISC-V, in case you don’t know, is the latest incarnation of the “reduced instruction set computing” architecture, devised by Professor David Patterson of U.C. Berkeley about 40 years ago. I interviewed Patterson about RISC-V last summer for Barron’s print magazine. The notion is that by making the “instruction-set architecture,” or ISA, of a chip more like open source, where it can be modified, it is possible to make chips that are tailored to a given need and therefore more efficient and less costly to produce. Some of these qualities are evident in the “Tensor Processing Unit,” or TPU, which Patterson helped devise for Alphabet’s (GOOGL) Google’s machine learning efforts. Mobley, who plans to hold a conference call about the topic on January 22nd, with the executive director of the RISC-V Foundation, Rick O’Connor, today offered up a summary of the non-profit organization and also the support its gaining by chip makers. He notes that hard drive and NAND flash chip maker Western Digital (WDC) recently gave its endorsement to RISC-V "as the company has pledged to transition its own consumption of processors to RISC-V."
"Western Digital ships over one billion cores per year, and plans to double that number,” notes Mobley. "And if all goes according to plan, they will all be based on RISC-V, according to recent statement." Mobley also points out that graphics chip titan Nvidia (NVDA) "quietly revealed that it’s going to build its next-generation GPU microcontroller on the RISC-V ISA,” which I had also learned independently from Patterson and from a company founded by one of his graduate students, SiFive. 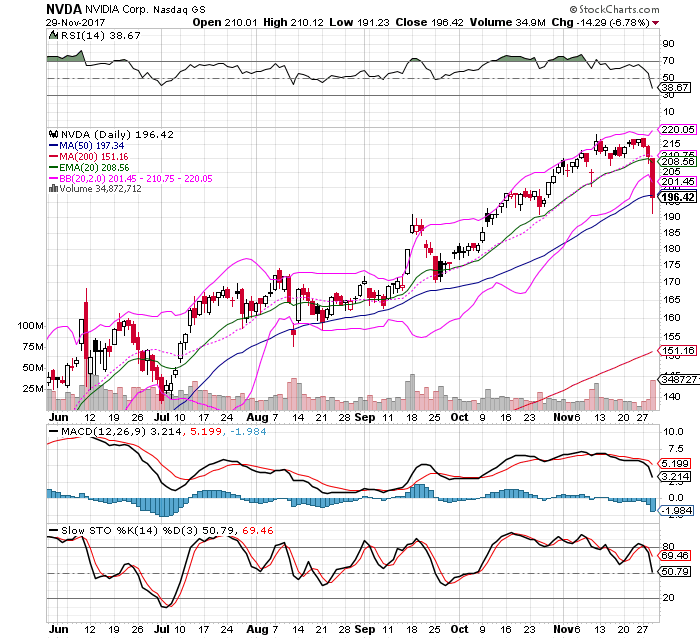 Action WE Took Nov 29: "Finally NVDA...it's a BUY under $200 with our $250 target as well. We will take ½ position tomorrow and add if it trades below $195. We have ALWAYS made money on NVDA on these pullbacks...so have others...that muscle memory is VERY fresh." Nvidia DID trade below $195 2 days later we completed the position the next trading day at $186 for a $191 cost basis. 50% position in $215 January Call Options <$8.50 again hoping we get some lower volume selling follow-through. We did... and got second bite of the January $215 calls at $2.50--taking our dollar cost average to $5.50. Action to Take: HOLD the Nvidia Options--Bid in $5.70 last but NVDA is up .90 in after market trading. 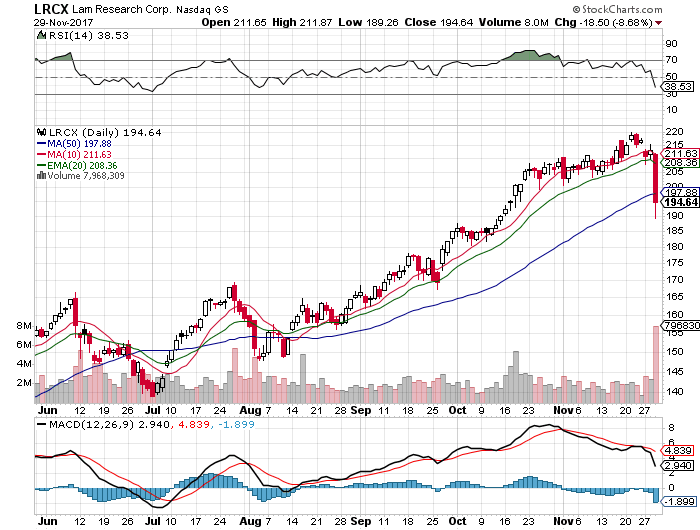 NOTE on MORL ETF: Get ready to SELL. The Tax Reform Act really does the hurt the value of high end second homes with the $750,000 mortgage deduction limit. That reality is getting priced into MORL since its a 2X play paying 22% dividend on mortgage REITs. Since the mortgage REITS now get GREAT tax treatment (20% tax rate of pass through distributions) we are analysing how we can recreate the leverage to get 22%+ yield via leveraged direct ownership of mREITs and hedge that risk. We are RIGHT at 200-day support...with the 2X leverage if it breaks and stays under 2-3 days we will bail and SHORT MORL with options. That is it folks...what and exciting turn of events! PS: I have been loath to bring you a cryptocurrency play...until now. Loosen up a few $grand to speculate in what I have researched for the last few months IS a real new blockchain technology platform protocol that has NONE of the bitcoin sustainability issues (read $billions in energy costs), slow transaction times and is truly a game changer in the economics of unhackable and safe transferring of digitized assets. Don't Miss Another $Millionaire Making Opportunity Again! Get our FREE ELetter Transformity Investing every week and start building a lifetime of wealth.